Best possible Service for your mobility and cost controlling. Your buses should be on the road. 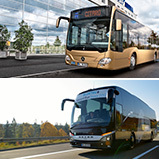 The needs-based OMNIplus Service Contracts guarantee you the optimal and affordable availability of your Mercedes-Benz or Setra vehicle. Our maintenance plans can be tailored to your individual needs. Combine services which fulfil the manufacturer's requirements with different types of repair. Regardless whether your vehicle is a new or a used one, you will benefit every time with our Service Contracts. We guarantee it. Secure yourself the advantages of fixed maintenance plans and costs you can calculate. Choose from the different yearly mileages and combine those with the drivetime to calculate the package best suited to your company. They can also be adjusted to include additional services if required. Available for all Mercedes-Benz and Setra vehicles from Euro VI onwards.